Add one quarter to one half cup of margarita salt to a small bowl. 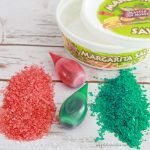 For every quarter cup of margarita salt, add two drops of food coloring. Stir with a fork or a small whisk to combine. Repeat steps 2 and 3 with one drop of food coloring at a time until you achieve your desired color. Make sure you are using true margarita salt. The texture of table salt, sea salt, and kosher salt don't adhere to glass rims quite the same way. Even if the food coloring appears to be the color you want, you may need to add a drop or so of another color. I found that green food coloring turned the salt turquoise. A single drop of yellow created the perfect shade of green for the holiday season.